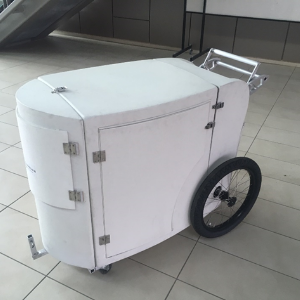 The intention of the Personal Belongings Carrier Project (PBC) is to create a user-friendly, secure and portable cart in which homeless individuals can store their personal belongings. Your support for the project will help address a challenging situation confronting homeless populations and the communities where they live. People who are homeless are forced to organize their daily lives on a minute-to-minute basis. Having to keep their belongings at all times reduces their ability to use services that could have the potential to effectively improve their quality of life. This dignified solution will encourage a sense of pride of ownership, security and enhance personal well-being. Your donation to this project will help to give our homeless population a user-friendly and secure way to store their valuables, and give each individual the opportunity to engage more fully with social support services. If five donors give to the Personal Belongings Carrier, the project will receive an additional gift of $150.